Coeur d’Alene is a special community, blessed with natural beauty that most people can only dream about. A true four-season climate brings unique beauty no matter the season. 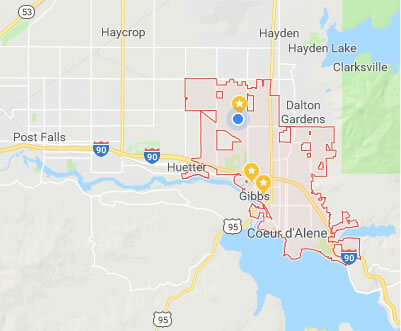 Whether you enjoy lakes and mountains in the great outdoors or world class amenities in a friendly indoor environment, Coeur d’Alene has a wealth of luxuries and opportunities to offer you. Although buying or selling real estate can seem confusing, it doesn’t have to be that way. By choosing to work with a qualified REALTOR®, you are making your sale or purchase an even better investment. A qualified real estate broker can help lead you through the process and is trained to look for details and potential problems that you may not even know exist. Until the early 1890s, Coeur d’Alene served as the railroad/steamboat transfer point for transportation between the mines in the nearby Silver Valley to the smelters they fed in the eastern states. In the early 1900s, a major timber boom caused the population to increase 16-fold in a period of 10 years. The oldest standing building in Idaho, the stately Cataldo Mission, finished in 1853, is 25 miles east of Coeur d’Alene just off of I–90 on the south side of the highway. retrieval program. The district also offers full-time kindergarten at four schools, a special needs preschool program, and student opportunities at a joint professional-technical high school campus (KTEC) shared by neighboring school districts. Educational choices are provided with three magnet programs: Sorensen Magnet School of the Arts and Humanities and Ramsey Magnet School of Science (both elementary), and Lakes Magnet Middle School with an emphasis on Science, Arts, and Health. Other elementary schools of choice include Hayden Meadows, adopting an emphasis on technology; Fernan STEM Academy, offering a science, technology, engineering, and math focus; and the Northwest Expedition Academy, an expeditionary school exemplified by project-learning expeditions. The district offers Advanced Placement (AP) opportunities for qualifying high school students, as well as dual enrollment programs with institutions such as the University of Idaho and North Idaho College. Additionally, Coeur d’Alene Public Schools recently opened North Idaho’s first Total Communication preschool classroom and is the only district in North Idaho offering an orchestral educational experience for students in grades 5-12. The district places a high priority on technology for staff and students, recognizing that it is a catalyst for teaching and learning. Every school has an active parent organization and the district employs 8 of the last 17 Idaho Teachers of the Year. Today, the city bustles with festivals, fairs and concerts. Many of the activities center around the lake with its pristine beauty that has earned it a reputation as one of the world’s most beautiful. Visitors and locals enjoy the friendly atmosphere of City Beach and the numerous water activities, which include water skiing, fishing, jet skiing, parasailing, boat cruises and seaplane rides. Lake Coeur d’Alene is 25 miles long with 135 miles of shoreline and an average depth of 120 feet. The golf course with the floating green at Coeur d’Alene Resort has been called America’s Most Beautiful Resort Course by Golf Digest magazine. The floating green, on the 14th hole, measures 15,000 square feet and weighs nearly five million pounds. It can be moved on the water’s surface by cables attached to the lake bottom in order to change the distance from the tee to the hole from 75 to 175 yards or more. North Idaho offers 17 other courses ranging from intimate nine-holes to 18-hole championship. One of the most recent additions is an 18-hole course, Circling Raven, owned by the Coeur d’Alene Tribe in Worley, 30 minutes south of the city. Our area boasts numerous clean lakes for swimming and boating plus beautiful mountains for biking, hiking, backpacking and skiing. With seven state parks, dozens of lakes and hundreds of trails, you are always close to the great outdoors! Four ski resorts are only an hour or so away. Over a dozen golf courses mark the area, including the popular Coeur d’Alene Resort Golf Course and its centerpiece floating green. In nearby Spokane you can enjoy concerts, plays and special events at the INB Performing Arts Center (formerly the Spokane Opera House), Spokane Convention Center and the Spokane Arena.